Sign up for an account at EcoBalance and earn a coupon for a FREE Nature’s Path Product up to $5! 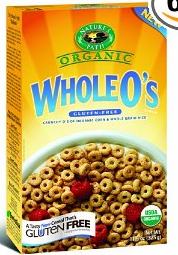 Nature’s Path carries quite a few Gluten-Free products including our favorite Organic Whole O’s. Sign up for a free EcoBonus account and get 15 points. Fill out your profile to get another 10 points. Click on the “Like” button on the EcoBonus Facebook Page and click “Fan Rewards” on the left side bar to get a code for 25 additional points. Redeem the code at EcoBonus by clicking “Enter Codes” at the top of the page. Your points will be “pending” but when they are available, redeem your 50 points for a free Nature’s Path product coupon.